It's been a banner day in the shop. Finally the patterns have been delivered to the caster. 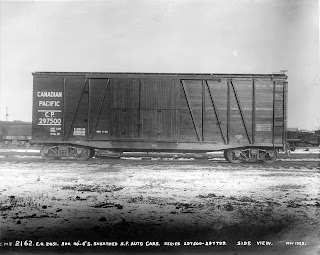 This CPR single sheathed auto boxcar has been an adventure and a learning experience. All the major components are 3D printed. A first for me. The technology is amazing, when used right. But it's not cheap. Good thing I didn't have to pay commercial rates for the printing or the drafting, otherwise this project wouldn't have happened. The biggest lesson we learned on this was to have all parts printed on the same machine at the same time. Calibration can be an issue, and it seems that there's some disagreement about how long an inch really is.. This kit will , of course, include laser cut running boards, photo etched details and Black Cat decals. The other neat trick in this kit will be the doors. Over the early life of these cars, they were rebuilt with 3 different door opening sizes. And the kit will include all 3 door options. If all goes well the kit should be ready for sale by the spring. Every now and then, clients send me really neat projects to build for them. This guy is in the top 5, fun adventures. 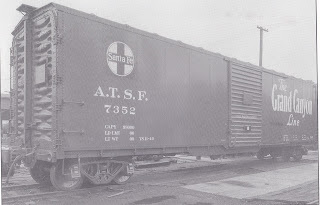 ATSF had a huge affinity with rebuilding cars, which in part endears them to me so much. (I love rebuilds). This class of 50' car was rebuilt in 1940-41. The original intent was to rebuild 50, 50' cars with single doors and end doors. But as the work progressed an urgent need for 50' auto parts cars without end doors arose, so only 5 of these cars were ever built. Making them one of the rarest car types on the ATSF or any other road for that matter. Creating a model of this rare beauty required 3 major components. 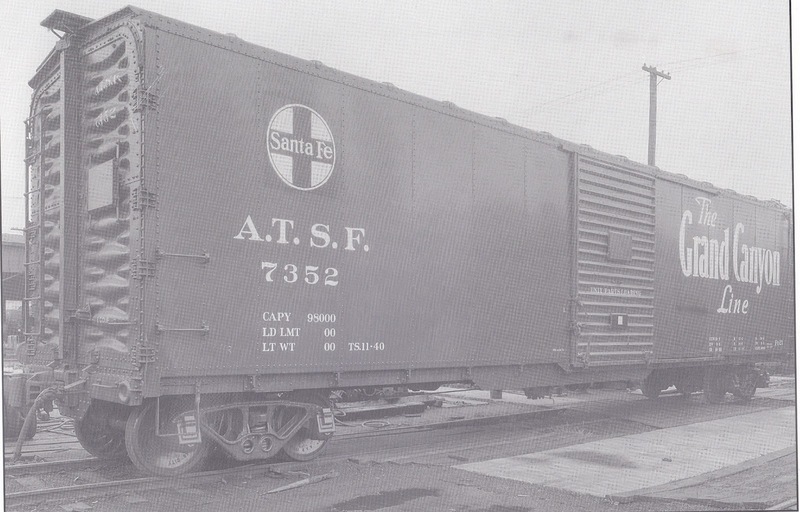 A Proto 2000 50' single door boxcar kit. I had to saw off the door end from the double car. As well as saw off both ends on the single door car. Cut off the molded side sill from the single door car. Glue on the end door and the resin B end. Add the recessed side sills and putty the cuts in the roof. With a little care and careful planning the cuts were easily accomplished. From there, it was a straight forward boxcar detailing job. I tossed the kit ladders and most of the other plastic details and used my own ladders and rungs, Kadee bracket grabs, my own sill steps, Tichy brake parts, etc. A model this unique deserves the best. With the standout "straightline map" this car is a standout. I'm really very pleased with how this turned out. Now I want one for myself. From time to time, I'm asked to paint O scale brass rolling stock. Which I'll do for certain clients. They are a nice departure from the norm around here, but man do they take up a lot of space! And a lot of paint as well. All these cars were painted with Scalecoat, which once baked comes out very hard and smooth and glossy. Bonus for decaling. The first 4 shown are Protocraft models. Which are stunning works of art. And I'm relieved to discover that the Wabash boxcar is sold out, so there goes that level of temptation. Nothing says Xmas in a childless household, like soldering caboose parts. The kits comes with a very nice array of etched parts. And this morning, I decided to solder the end step units. Like everything in this project, not terribly difficult, just verging on tedious. What with 48 of these assemblies. At some point I should think about the end railing assemblies. There's only 24 of those! With the steps all soldered up, it's time for a quick wash, to remove any flux residue. I'm now waiting for Lake Junction Models to send me the missing laser cut sheets. He mis-packed and left out a few key components, so the project is kinda stalled right now. So this is what 12 caboose kits at one time looks like after a day of initial work. What we've got here are 12 of Lake Junction Models M.P. caboose kits, #7001. I chose this model as I feel that it's very close to the Wabash 2600 series caboose and with a little extra effort on my part, one will be hard pressed to tell the difference. One of the major features is the windows. 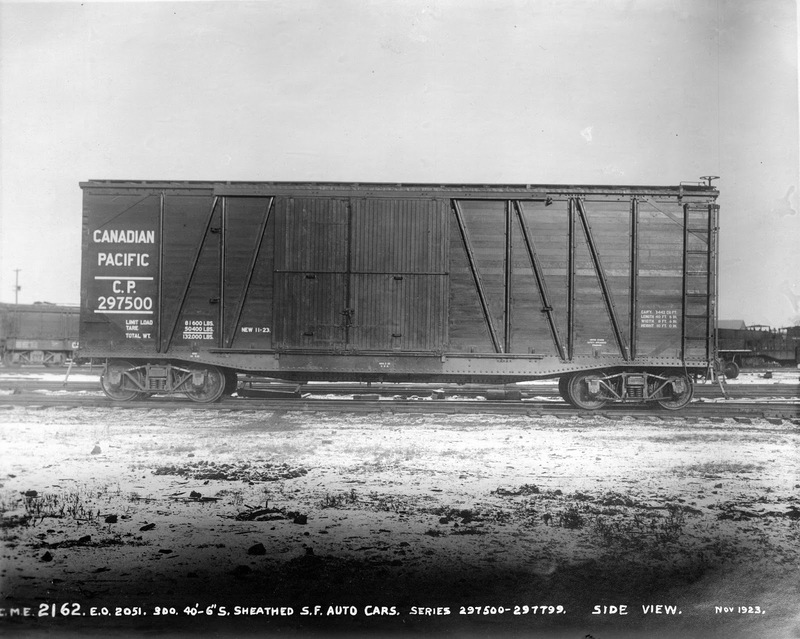 A large number of the 2600 series cabooses had 4 windows on both sides, but photos also indicate that there were cabooses with only 3 windows on one side or the other. So I had Lake Junction run me a few kits without the cupola end windows and I took upon myself to mix the sides up a bit and create that variety in the fleet. You can see how things are shaping up in the photo of the 12 body cores. As I make progress on this large project I'll post photos and talk about what I've done. Back in October, while at the Chicagoland RPM, I purchased one of Resin Car Works Missouri Pacific 50' steel autocar kits. I like autocars and since MP is a connector road to the Wabash I thought I could easily rationalize it's presence. When I got it home and had a closer look, I was very pleased with what I saw and decided that a block of these cars would be order, so I ordered 2 more from Frank Hodina. Yesterday I put the finishing touches on them and I'd like to share them with you. In 1951, my modeling era, these cars would be 10 years old and would have shown some wear and tear. And probably be close to needing a repaint. With a couple of notable exceptions, the kits were built using components that were supplied in the box. I substituted the A-Line sill steps with some etched steps from my own product line, YMW #212. And I used my etched ladder rungs in lieu of the wire grabs supplied. I have to say that I'm very pleased with the look of the ladders. So much so that all future Yarmouth Model Works kits that use etched ladders will likely include etched rungs. In weathering the cars I tried something new for me. Paint failure on galvanized steel roofs. Much as been written on this topic and a few techniques exist for replicating this detail. I've avoided this finishing for years since I wasn't feeling terribly confident in what I might achieve in trying to recreate this look, as well as I've seen a few examples of this look that didn't look right to me. However, a query on STMFC Yahoo Group, garnered me a few photos of roof paint failure and a tip from someone online got me to try the following. Now I wish I could remember who I got this from, and I'm really sorry I can't recall, but whoever you are, THANKS! I weathered the roof some with oils and then simply drew on the roof with the pen. Random patterns and played a little. A coat of flat finish to kill the shine , a dusting of grey and voila! The nice thing about this method is that I can go back, add more if I like or repaint the roof and start again if I've gone too far. The look is growing on me and I suspect that a large amount of my existing fleet will be getting paint failure on the roofs. Over on STMFC Yahoo Group, (Steam Era Freight Cars), I was asked for an image of what the lateral running board supports (part #YMW-381) look like when formed. Well here you go .